Save a 1/3rd on tickets: The Dales Railcard costs less than 20p a day. The Dales Railcard costs just £10. They can be purchased by residents of postcode areas bounding the Settle – Carlisle railway line, between Skipton and Carnforth, Carlisle and Brampton or in the Clitheroe/Whalley area. 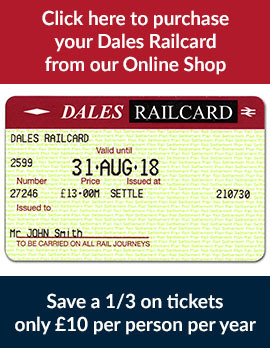 The Dales Railcard is valid for 12 months and provides savings of 1/3rd on the cost of tickets within the specified area. As well as savings for the railcard holder, up to four children accompanying each Dales Railcard holder are eligible for discounts of 81% on the full adult fare. The minimum fare for a child is £1.00. Dales Railcard holders can also take advantage of the annual winter offer when a great value flat rate ticket is available. We make every effort to advise Dales Railcard holders of the annual winter offer and any other news and offers. This information is only sent to persons who have given their permission in the consent box on the application form or, who have subscribed to our mailing list. To receive updates about the Dales Railcard winter offer and much more, you can subscribe to our mailing list here. Who’s eligible for a Dales Railcard? Where can I use my Dales Railcard? You can use a Dales Railcard to save money on single, off-peak and cheap day return and standard open return tickets. Travel validity is between all stations on the Leeds-Carlisle and Leeds-Lancaster/Morecambe lines (plus Brampton and Wetheral on the Tyne Valley line) and between Clitheroe/Whalley and Hellifield (Sundays only). The restrictions are that it cannot be used exclusively within the Leeds/Bradford/Skipton area or exclusively between Carnforth, Lancaster, Bare Lane and Morecambe. Download the leaflet for a map showing all the stations. Where Can I Buy a Dales Railcard? Dales Railcards can be purchased at Appleby, Carlisle, Carnforth, Settle or Skipton Railway Stations using the application form or you can complete a form at the station. You can also purchase or renew your Dales Railcard in our online shop here.